Rini Tekriwal, Dharitri M Parmar, Ravi Saxena. Objective: To compare the prevalence and degree of noise induced hearing loss at speech frequency and at 4000Hz among textile workers of Surat city and also to compare the effect of duration of exposure to noise on them. Results: Among 50 workers exposed to high level of sound, at speech frequency 80% workers had some degree of hearing loss and 20% were normal whereas at 4000Hz 90% workers had hearing loss and 10% were normal. At speech frequency 62% workers had mild degree hearing loss and 18% had moderate degree of hearing loss whereas at 4000Hz 4% worker had mild degree, 36% had moderate degree, 38% had moderately severe degree and 12% had severe degree of hearing loss. When the duration of exposure to noise is consideredâ€”workers with <10 years of exposure (n=15), at speech frequency 53.33% had normal hearing and 46.66% had mild degree of hearing loss. At 4000Hz, 20% had normal hearing and 80% had hearing loss---13.33% had mild, 40% had moderate and 26.66% had moderately severe. With duration of exposure between 10-20 years, at speech frequency 13.33% had normal hearing and 86.66% had hearing lossâ€”80% had mild and 6.66% had moderate. At 4000Hz 13.33% had normal hearing and 86.66% had hearing loss--- 53.33% had moderate and 33.33% had moderately severe.With duration of exposure >20 years, at speech frequency all workers were suffering from hearing loss--- 60% had mild and 40% had moderate. At 4000Hz again all workers were suffering from hearing loss--- 20% had moderate, 50% had moderately severe and 30% had severe degree of hearing loss. When the prevalence of hearing loss was compared between speech frequency and 4000Hz no significant difference was observed but highly significant difference was observed when degree of hearing loss was calculated. Similarly, duration of exposure does not have any significant difference between speech frequency and 4000Hz as far as prevalence is concerned. But degree of hearing loss is significantly higher at 4000Hz than at speech frequency. Conclusion: From this study it can be concluded that the degree of hearing loss was very high at 4000Hz than speech frequency, although the difference in prevalence could not be established statistically. Rini Tekriwal, Dharitri M Parmar, Ravi Saxena. Noise induced hearing loss - A comparison between speech frequency & 4000Hz frequency. Natl J Physiol Pharm Pharmacol. 2011; 1(2): 79-85. Rini Tekriwal, Dharitri M Parmar, Ravi Saxena. Noise induced hearing loss - A comparison between speech frequency & 4000Hz frequency. 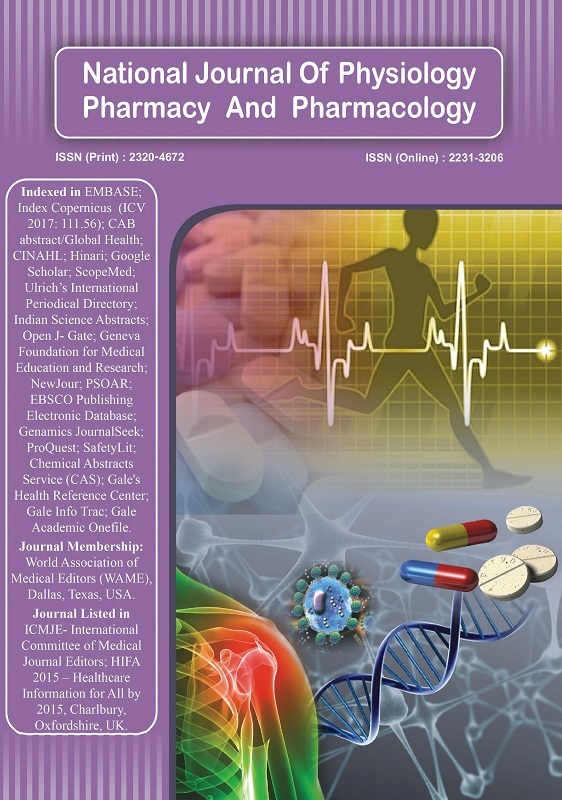 http://www.njppp.com/?mno=8539 [Access: April 25, 2019]. Rini Tekriwal, Dharitri M Parmar, Ravi Saxena. Noise induced hearing loss - A comparison between speech frequency & 4000Hz frequency. Natl J Physiol Pharm Pharmacol. (2011), [cited April 25, 2019]; 1(2): 79-85. Rini Tekriwal, Dharitri M Parmar, Ravi Saxena (2011) Noise induced hearing loss - A comparison between speech frequency & 4000Hz frequency. Natl J Physiol Pharm Pharmacol, 1 (2), 79-85. Rini Tekriwal, Dharitri M Parmar, Ravi Saxena. 2011. Noise induced hearing loss - A comparison between speech frequency & 4000Hz frequency. National Journal of Physiology, Pharmacy and Pharmacology, 1 (2), 79-85. Rini Tekriwal, Dharitri M Parmar, Ravi Saxena. "Noise induced hearing loss - A comparison between speech frequency & 4000Hz frequency." National Journal of Physiology, Pharmacy and Pharmacology 1 (2011), 79-85. Rini Tekriwal, Dharitri M Parmar, Ravi Saxena. "Noise induced hearing loss - A comparison between speech frequency & 4000Hz frequency." National Journal of Physiology, Pharmacy and Pharmacology 1.2 (2011), 79-85. Print. Rini Tekriwal, Dharitri M Parmar, Ravi Saxena (2011) Noise induced hearing loss - A comparison between speech frequency & 4000Hz frequency. National Journal of Physiology, Pharmacy and Pharmacology, 1 (2), 79-85.